OPI's most recent collection features shades straight out of the chic city! And Brooke says Feng Shui too! I'm all on board with this awesome shade. Cool fact? "Feng Shui" translates literally as "wind-water" - and this shade is a perfect mix of sky and sea blues. OPI is famous for their fun and unique polish names, and I've got to say that 'Dim Sum Plum' is one of my favorites in this collection. Dim Sum Plum is a very pretty dark magenta/berry creme. It photographed more accurately in the picture on the right. Dim Sum Plum was a very nice, smooth formula that covered in just two coats. Like Suzi Says Feng Shui, it had an awesome shine even without a topcoat. Dim Sum Plum is similar to a few other pinks I own (and you know I own A LOT of pink polishes), but it was not a dupe. See the end of this post for comparison shots. The polish everyone is talking about this season! When I first heard that there was going to be a Jade-shade, I was hoping it would be a light Jade, a la Chanel Jade. But now that I've tried Jade is the New Black, I am quite pleased with it and actually feel I prefer the deeper more pigmented Jade to Chanel's wishy-washy one. Who would have thought? Jade covered really nicely with two coats and dried quickly. It is a cool blue-ish green (slightly teal) with no glitter or shimmer. It is a really awesome, unique shade. Really pretty. My mom came by while I was doing this review and instantly gravitated towards this color. She's polishing with it right now as I type, actually! I love this one! It really surprised me because it is so unique. Star Ferry is a deep, dusty plum with tons of multicolored glitter that shone beautifully in the sun. It covered nicely with two coats and the thin formula applied well. Are there pandas in Hong Kong? I know there are over 7 million people living there, so it doesn't seem like it would be the most habitable environment for the little bamboo munchers. But that aside, Panda-monium Pink is a really fun shade. It reminds me of OPI Mod About You with a little more pinkish warmth and none of that chalkiness. Since I'm a big fan of Mod About You, I am pretty enthused about this shade. It is a nice, light tone that would be excellent for a job interview or wedding. Again, great formula - this collection really blew me away with how consistently nice the formulas were. Panda-monium Pink covered with just two coats, but dried a little slower than some of the others. I have a lot of pinks, but I don't have a dupe for this one. Yay! Check out the pink comparison shots at the end of this post. Another hot one I loved? Red My Fortune Cookie. I don't wear red polish often, but this one was a surprisingly great shade with my skin tone. It is a blue-based red, so it worked with my paleness. Doesn't it look absolutely awesome with the black letters and bottle top? I would love to have a room with accents in this shade against black. Red My Fortune Cookie applied nicely - the formula was great - and dried fast! It is a bright red creme with blue undertones and no glitter. One of my favorite red polishes of all time, hands down. Pearl of Wisdom is a gorgeous opalescent white with silvery shimmer. The formula is thin and easy to work with, plus it dried quickly. As you can see, my index and middle fingers have artificial nails on them. Pearl of Wisdom covered well on those fingers with just two coats, but on my natural nails, two coats is still somewhat translucent. I wish I could accurately photograph how beautiful this shade is. It really blew me away. This is one I'm going to need to buy a few bottles of, because I can see using this one for many, many years to come. Scroll to the bottom of this post to see pictures of Pearl of Wisdom as a top coat - it looks amazing over top of colored polish! You all know I'm not a huge fan of orange anything, but A Good Mandarin really surprised me. And with such an adorable name, how could I not love it? A Good Mandarin is Hard to Find is an excellent smooth, easy to work with creme polish. It covered well with two coats and dried quickly. I would classify it as a reddish orange and it actually went really nicely with my fair skin (shocking, right?). This is a very warm shade and looks just like the photo on the left. I have a few OPI golds that I absolutely adore (I Get a Kick Out of Gold, Las Vegas Strip Poker), so I was pretty excited about this one. 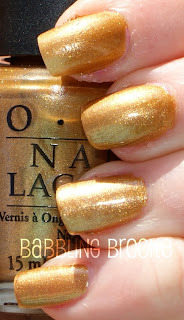 Bling Dynasty is a gorgeous glittery gold with a slight bronze tone. It covered well with two coats and applied nicely. I've been looking for a bottle of I Get a Kick Out of Gold to give my sister, but I think this will be an excellent substitute. Hot & Spicy is my least favorite of the collection. It was just too bright for my fair skin, although I think it would look really nice on someone with a darker skin tone. It is a bright, fun summery creme with a thick and difficult to handle formula. This was the only one out of all 12 that did not have a superb formula. It covered well with three coats. Another name I love :) I just love the play on words. And this polish also really impressed me - it is a very unique neutral. Chopsticking covered well with just one coat (but I still used two, being the perpetual over-polisher I am). It is a slightly-mustardy caramel which while likely an absolutely horrible food combination, works really well in this shade. Certainly more of a fall shade, but I like what it brings to this collection. Sorry this one is such a mess - it looks like I painted it with chopsticks! Pearl of Wisdom also looked incredible over other shades. So what do you think of the Hong Kong collection? And which shade is your favorite? Thanks for stopping by! The products in this review provided by the company or PR firm. Ooh, I really like Suzi Says Feng Shui! I love blues. I think I just might have to get this. Based on my most recent blog post I am now beginning to wonder if Dim Sum Plum is a dupe for Illamasqua Grab...hmm. OPI sent you these?! I'm so jealous! Great post! These look lovely. I just got Jade Is The New Black, Dim Sum Plum and Suzi says Fung Shui. Jessica, excellent choices! Three of my favorites! How do you like them? Thanks Liz, I'm glad you like it! Come on over and try them out sometime! Thanks krisprimps, glad you loved the collection too! Great swatches! I'm really liking Jade is the New Black and Bling Dynasty from this collection. Thanks So Very Fabulous! I think Bling Dynasty is actually a really unique gold since it is slightly bronze. I need Meet Me At The Star Ferry & Pearl Of Wisdom! Nice comparisons, I have "meet me at the star ferry" and it totally sparkles int eh sun...amazing! I really want ALL of these polishes!! Your nails looks so absolutely amazing. Such a difference with the millionails. I'm hoping it'll start working for me soon! I haven't painted my nails in a couple weeks, and it's KILLING ME! Haha. Thanks Kelsea- and I'm glad you like them!! Two of my nails on my left hand are fake :( bc they keep breaking, and on my right hand (which I had to photograph for Lucky Lucky Lilac because I messed up the left getting the camera out) I have one fake nail because it totally broke. But I'm still happy with all my others! Great swatches! !My favourite from this collection is Jade is the new black! Thank you GildedAngel :) Thanks for sharing the link too! Glad you like them Geo58!!! I am obsessed with Suzi Says Feng Shui - it is my favorite in the collection, and I agree - the names are great! Thanks for checking out my blog! !